Hi again! It’s been a while, but now seems like a good time for a new UniBlog to go with the new, sparkly, Unicorn Group website whose “PlayWithTheBest” title doubly resonates with me. Not only is helping players do just that my aim when designing a dart or recommending a set-up, but also, in my long-gone competitive racquet sport days, I was lucky to have had the chance to play with some of the best and most prodigiously talented individuals of the era. I thus had the perfect opportunity to observe at first hand how “best” and “most prodigiously talented” were not necessarily coincident. Prodigious talent is obviously a gift, but I wonder if sometimes it can also be a hurdle to overcome. If playing a sport comes all too easily at first, is it more difficult later to knuckle down to the hours of potentially tedious practice (and, in many events, arduous physical training) required for even the very gifted to fulfil their ultimate potential? Reaching the top in sport generally requires not only innate talent, but also a willingness to graft combined with a winning mindset. The latter two may not tend to be regarded as “talents”, but all are qualities the true greats must possess. However, very few amongst even this elite have them all to a prodigious extent. Perhaps Roger Federer in tennis and Pele in football are two examples who do - you may come up with more in sports you particularly follow (personally, I’d add Lin Dan in badminton and perhaps Jahangir Khan in squash). It’s an interesting exercise to think of a sporting great and then estimate the proportions in which these three qualities are present. Let me throw some names at you to get you started. I’ve already mentioned Roger Federer, so how about Jimmy Connors, winner of even more pro-era singles titles? How would Ronaldo score compared with Pele? Sugar Ray Robinson with Muhammad Ali? Ronnie O’Sullivan with Stephen Hendry? Tiger Woods with Jack Nicklaus? And, finally, in our own sport, MvG with Phil Taylor? I’m going to leave you pondering on that while I move on by resurrecting, after a long absence, the occasional “Technique Spotlight” feature in which I take a look at the throwing style of a player with whom I’ve had the pleasure of working (albeit, in this case, only briefly). And there is a non-coincidental link with the topic above because the subject this time is indeed prodigiously talented; so much so, in fact, that he can throw not only in his own style, but also in that of many other top pros (check out YouTube to see what I mean!). 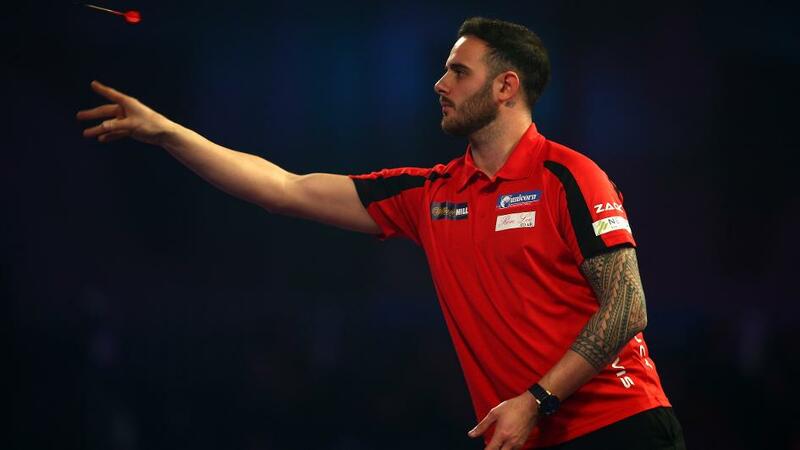 Since my last blog this player won a long-overdue maiden PDC title in April (and was hence subject of a subsequent nice little piece on ITV4’s “The Darts Show”) and then followed it up with a second title in July (coincidentally also at Barnsley Metrodome). I’m talking about that inimitable mimic, The Rockstar himself, Mr Joe Cullen. One notable characteristic of Joe’s throw is that his stance is slightly less side-on than is classically advised, with his right foot facing more forward into the oche rather than at a sharp angle or even parallel to it. His right throwing shoulder and elbow are thus to the right of his eyeline, which doesn’t seem to bother him at all as he doesn’t really attempt to throw down it. Not only does his backswing go well outside his right cheek, almost towards his ear, at release his head can tend to sway fractionally left, yet further off the line of the trajectory. Joe’s exceptional level of hand-eye co-ordination seems to mean none of this is a problem for him. Rather than worry about throwing down his line of sight, he simply looks at the target and the dart tends to go there! Part of the reason this works may be that his technique enables him to exploit, again rather against classic coaching advice, the potential advantage of a small forward motion of his shoulder adding a “pushing” element of linearity into his throw. Other aspects of Joe’s technique are rather more conventional. His has a standard index finger/thumb mid barrel grip with his second finger resting just in front of the point junction. At release his 21gm, fairly coarse-gripped, 50.55mm long, “pencil” darts are nicely flighted moderately point-up and land in standard point-down fashion. Elbow extension after release is good without being exaggerated. I believe that Joe’s innate talent and that “look at it and then hit it” style has the potential to make him a truly great finisher. To hit the very heights of the game will require combining this with even more consistency in scoring power than he has sometimes shown in the past. Looking at the mechanics of his particular style with its extra number of “moving parts”, I also reckon that achieving such consistency will require just as much dedication to practice as is required by those of less inherent ability. Which sort of brings us back to where this blog started. Fortunately, it appears that Joe himself appreciates all this, so let’s hope that The Rockstar can, as a result, make yet further progress toward storming that list of true greats! If you have any comments or questions for UniBoffin, please do so through the link below.